Standard Pacific Homes announces the completion of the first building for The Live-Work Collection Lennox at Brier Creek at , a unique option, perfect for the lifestyle of today’s modern family. The live-work townhome offers homeowners the opportunity to have a dedicated work space on the first level of their home that can be either a separate home office or low traffic business with its own entrance. This space is designed for businesses such as that of an attorney, insurance agent, psychologist or real estate broker. Homeowners enjoy the benefits and ease of living upstairs, saving both travel time and the expenses of a daily commute and/or the cost of rent for a multi-year contract for a personal business. The Brier Creek area offers numerous amenities including fantastic shopping, cultural activities, cafes and fine dining, entertainment venues, world-class healthcare, parks and Raleigh-Durham International Airport. Lennox is also close to all the excitement of downtown Raleigh and Durham. Plus, with a live-work home you have the added benefit of a tax write-off for your home business. The Lennox Live-Work townhomes feature a large master bedroom suite on the main living floor which has a balcony, two additional bedrooms upstairs and two full and two half-baths. There is a second balcony off of the living area on the main floor as well as a private courtyard and patio in the front of each residence. 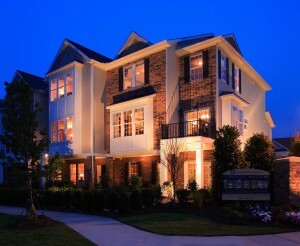 The townhomes also offer a large game room, an oversized, two-car rear-entry garage and an elevator option. The clubhouse is currently under construction and will be opening sometime in 2009. It includes a fitness center, business center, full kitchen for events and private parties as well as both a lap and recreational swimming pool. Townhomes in the Live-Work Collection are available in two spacious floor plans – one 2,903 and one 2,929 sq. ft., with prices starting in the $360s. In addition to the Live-Work community, Lennox at Brier Creek also features three other separate and distinct townhome collections. There are 105 Designer Collection townhomes that are two stories with a single car garage, 106 Signature II Collection townhomes that offer homeowners three stories with a two car rear-load garage, and 62 two-story Country Club Collection homes that feature ranch-style floor plans with a first floor master and both one and two car garages. Directions: From I-540/Hwy. 70W turn left onto Brier Creek Parkway. Turn left on Vogel St. at the Brier Creek Elementary School. Lennox at Brier Creek is at the corner of Vogel St. and Bruckhaus St. This entry was posted in North Carolina, Raleigh new homes and tagged Brier Creek townhomes, home offices, lennox townhomes at brier creek, Raleigh new homes, Standard Pacific on December 12, 2008 by Standard Pacific.